Session 206. Got on the water a bit after 5pm with about 20 knots consistent sea breeze blowing, there were only two other kiters there, one just finishing as I set up. There was a nice small bay surf and the stiff wind with my Lithium 12 was good for speed. Some of the swells were rideable with the kite parked. I was able to ride heelside out (left) and come back in toeside (right) with easy. The "post turn gybe" (right) and "pre turn gyble (left) are both quite consistent now. I am feeling quite confident on the surfboard and like the ability to ride the waves and swell. Its easier to negotiate the bay surf too as the board pops over broken waves easily. Boosting off a wave lip is fun with both feet in the straps, but can be dicey with only one foot in. I did the splits once. I had a couple of big stacks and got well rinsed. A couple of other kiters arrived towards the end of the session, but overall it was remarkably uncrowded considering how good the wind and waves were. The backpack camera mount has been fiddly to set up but worked OK this session. Here's the video. I have had quite a few days kiting in a row now, and they have all been good. Time for a rest day, maybe . . . Session 206. Got down to Hampton just before 5pm. Lena and Chloe headed up the beach to make some sandcastles while I setup my Lithium 12. 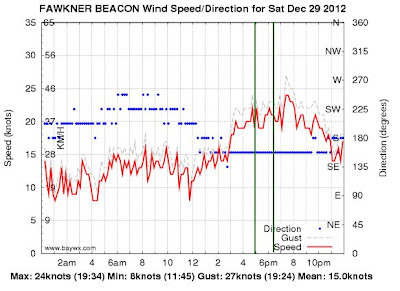 I was keen to try it out in some stronger wind so the 20 knot sea breeze was good for that. The kite handled the wind well, I didn't need to depower it. I did a run back to the beach then headed out again and did some slalom turns back to the Middle Brighton beach. I joined several kiters who were enjoying the small surf along the beach and at Green Point, including Franz du Plessis. It was a nice coming in from Green Point and picking a wave to ride and parking the kite. The waves break over the small reefs. Riding toeside is now quite straight forward and turning among the waves is great fun. After the run into the beach a short tack upwind takes you back out past Green Point ready for another run in. I tried my new shorty wetsuit - it was great. It has more freedom than a steamer and better than the wetsuit shorts and top combination I have been using recently as the shorts fill up when I body drag after a crash. After the waves I kited back upwind to Hampton. 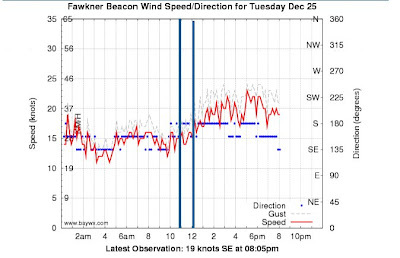 A really nice session with lots of variety - downwind run, slalom turns, gybes on the surfboard, small surf action, a couple of small jumps, then upwind to finish. Session 205. The hot northerly turned into a raging southerly at around 3pm. I got down to Hampton at around 4pm and was stoked to see good waves and lots of wind. I pumped up my Crossbow 7 but left in on the grass while I locked my car. That is a no no. Another kiter was standing on it when I got back to the kite. 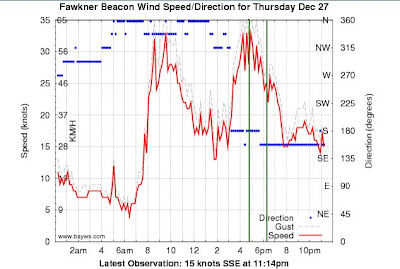 There is wind swirling everywhere when its 30 knots. I refitted the footstraps to the surfboard as conditions looked quite choppy, and I was glad that I did. Rick was on the beach and hoping for the wind to drop as his smallest kite was a 10. Most kiters were out with 8m or smaller kites. I had no trouble getting out through cross onshore shore break and headed out, climbing over the big swells. 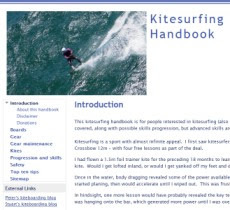 Its a whole different experience kiting in such strong wind and bigger waves. I even de-powered the 7 for a while! There was a good surf rolling between the two rock groynes. I shared the waves with 5 other kiters, most of them on surfboards. I got a few shots of them with my kitecam and helmet cam. I ended up on the beach a couple of times when my board was washed in after a stack, but getting out again was easy in the strong wind. Session 203. After some wild northerlies during the morning (and the hottest ever Melbourne night) a good southerly came in during the afternoon. I headed down to Gnotuk Ave where Tim, Franz, Wayne and several other fanatical kitesurfers were out in the bay surf. Its a whole different feeling, and a nice one. Popping off a wave make it quite likely you will come off the board, and it seems to dance around a lot more. It feels much more like surfing. Gybing felt suprisingly difficult too for some reason, but riding toeside was definitely easier. I headed out the back and was negotiating some quite big swells. I then accidentally released my safety during a stack so the kite hit the water and I couldn't reset the chicken loop so it was carted into shore by the surf. I secured it, then carried it back to the car park. Franz said he thought it was easier in the bay surf/chop to use footstraps, but I was quite happy to have completed my first reasonable session riding strapless. Yet another progression in this wonderful sport. Overall, a great session, sans technologie! Session 202. A south easterly sea breeze came in late in the afternoon so I headed for Mentone. It was nice and sunny with a breeze blowing when I arrived. I was having doubts it would be strong enough as I rigged the kite but I self launched the Lithium 12 with ease. On the water I was zipping along - heading towards the mussel farm near Ricketts Point. 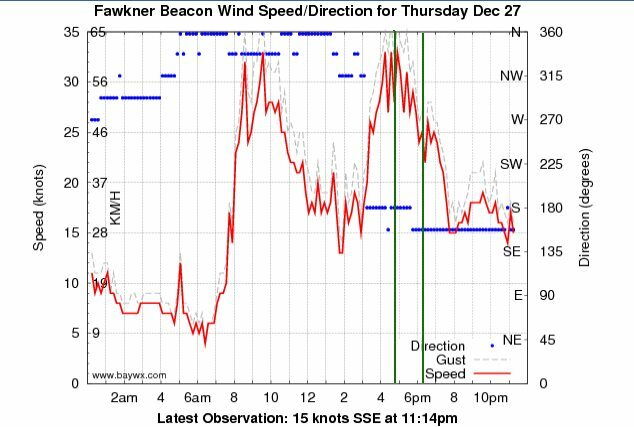 I did one tack back towards Mentone, going upwind without much effort, then decided to try for a longer downwinder as training for the upcoming Across the Bay to Conquer Cancer event. I rounded Ricketts and tracked more downwind, flying the kite from left to right as I passed some fishing boats. I was able to turn from left (heelside) to right (toeside) while going fast downwind, but could not do this in the opposite direction. My toeside riding heading left is still not so good, and the kite would come all the way around and stop when I attempted this turn. I came back into shore riding toeside and occasionally changing to heelside close to the Cerberus wreck and again near Sandringham Marina. There were a few kiters out at Hampton as I cruised down past Green Point, then some more at Brighton. The wind picked up a bit so I depowered the kite for a while. 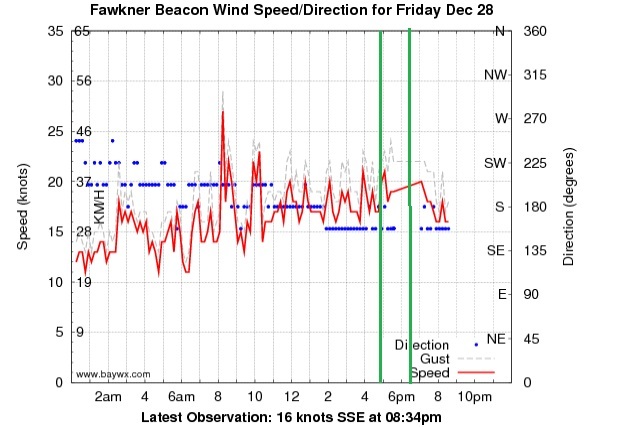 I was getting some good speed downwind and also cruising down some big bay swells. I cut the power and parked the kite for a few and rode them for a short distance. My rear leg was getting a bit sore so I was focusing on keeping it straighter and more relaxed. I began to have some some difficulty with the fast downwind turns - its quite a tricky manouver turning during fast downwind reaches. You have to keep the kite turning and the board heading back upwind enough to put some tension in the kite lines. I was leaning forward too much and diving forward so I started leaning back more during turns - this helped somewhat. I was heading towards the main St Kilda beach for a while and contemplated landing there if the wind dropped, but I got around the St Kilda Marina breakwall without any trouble. There were a few kites inside the breakwater. I wondered how they were going in the wind shadow. The wind dropped about 5 knots at this point so I had to keep the kite flying and turning fast. I tracked out again and toward the Spirit of Tasmania before coming in at Port Melbourne Beach, both elated and relieved to make it. Saffer (Athol) was on the beach having just finished his kitesurfing session so he kindly stashed my board and kite at his apartment nearby. I checked my phone, but my "waterproof" bum bag had leaked and it was not working (s*!t). I should have used another waterproof cover for the phone - and will do so next time. Tip: Never assume a waterproof bag or container will keep all the water out. Put sensitive items (such as phones) in a separate wasteproof bag, pouch or case. I caught the tram to Southern Cross station, scoffed a Hungry Jacks meal, then caught the Frankston train. I was still wearing my vest, wetsuit top and shorts and dripping a bit, but nobody was too concerned. I got off at Mentone and walked back to my car, arriving just on dark. Unlocking the key safe was impossible until a friendly local lent me a torch to read the numbers! So in conclusion, this is a great downwinder with a variety of scenery and some good bailout points along the way. Session 201. Today was a training session for the upcoming Across the Bay to Conquer Cancer fundraising event that Cesar Aldea is organising. We met up at Gnotuk Avenue with plans to do a downwinder to Port Melbourne. 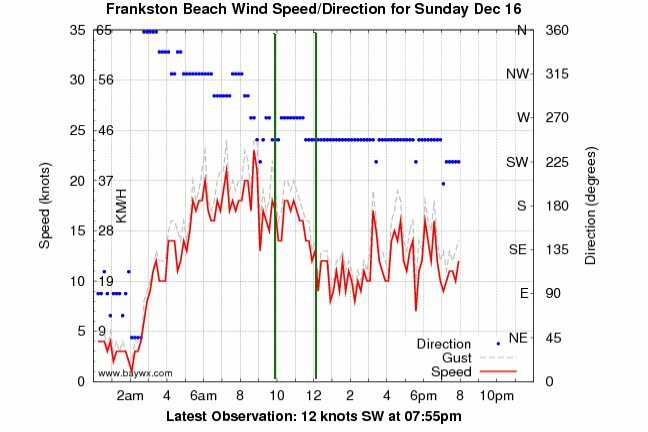 However, the onshore westerly made it too difficult to get around Rickett Point so we decided to do a downwinder to Frankston instead. 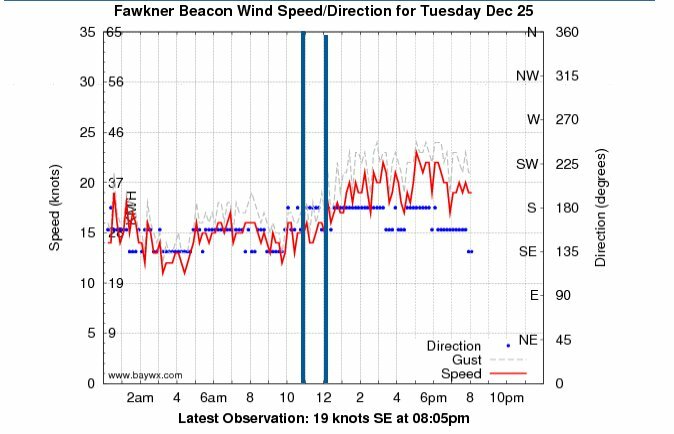 It was blowing around 25 knots at around 9am but by the time we were on the water at about 10:30 it had backed off to around 20 knots. I was concerned about more fronts bringing strong winds so I took my Switchblade 10 and surfboard. 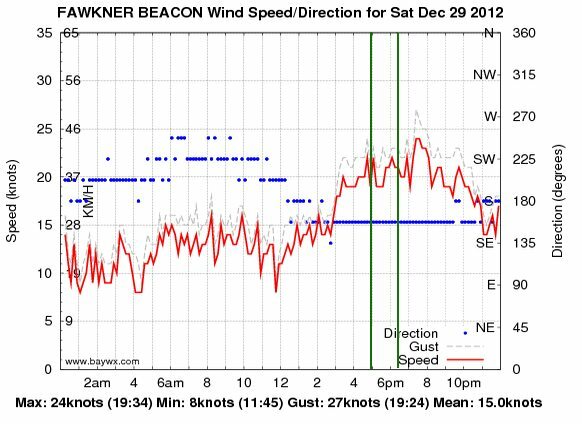 I should have trusted the Predictwind forecast, as it correctly predicted the wind would drop off around noon. We had a lot of fun in the surf on the way down, but by the time we got to Patterson River the wind had dropped to around 15 knots. Three of us waited for a while on the beach for the others to catch up then kept going. The surf was big enough to push the board towards shore and effectively decrease the wind strength. I was wishing I had my Lithium 12 and Sector 60 as I would have been cruising with them rather than slogging along a bit under powered. I didn't make it past the Seaford pier so I walked up to it and climbed over it, then continued kiting. I didn't quite make it to Gould Avenue when the wind conked out. Tim was going OK on his 10m kite so he headed back, just making it past the pier. I couldn't get going so packed up and caught the train back with two comrades. Tim picked up Cesar who made it back to Carrum, and the last rider made it back in a taxi! With downwinders, it is important to make ground while the going is good. Overall, we all had great session. The route from Sorrento to Port Melbourne will definitely be a challenge.